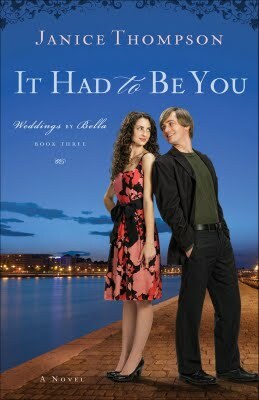 I have loved the Wedding by Bella series written by Janice Thompson and It Had to Be You did not disappoint (except that it means the series has ended? Say it ain’t so, Janice!). Bella is planning her own wedding to her hunky cowboy while at the same time planning a wedding between her aunt and uncle (unrelated to each other) who have loved each other for years but didn’t acknowledge it until the previous book. Every wedding has it’s challenges and this one does as well with fights and a swing band that magically can help heal relationships and the most oddly humorous assortment of characters you will ever meet, including a mobster and a parrot that sings Amazing Grace among other things! I don’t even know if I could survive a week in that household given the emotional upheavals and drama. Overall of that is love. Bella learns a huge lesson about grace and learning to depend on others when her body finally tells her to stop. I mean, literally, it stops her in her tracks. I love DJ and his faithful patience and adoration and listening to his bride-to-be. I really do hope they have the happily ever after they were planning on, because after all, it’s not the wedding that’s the most important, but the marriage, and I think Bella finally got that at the end. Janice Thompson is the author of Fools Rush In, that has comedy down to a science. Bella Rossi is an Italian living in Texas and planning a country-western wedding. The clash of cultures between her Italian family and the very country family of the man of her dreams, who she meets quite by accident, culminates in a series of slap-dash, laugh out loud and make you smile like-a –silly- goon- responses as one reads. I have rarely read a book with this much comedy so seamlessly woven in and where you can still connect with empathy for the inner struggles of the heroine of the tale, Bella. While some if it seems unbelievable it is totally realistic because hey, life IS stranger than fiction and it makes me wonder how much of this came from Janice’s own crazy life. I don’t know Janice personally so I’m only guessing here! I highly recommend this book. For a look at Texas and Italian culture (and what happens when they mix) and the difference we all bring to any situation we find ourselves in, this book is top of the list at making fun of crazy families, especially those who don’t hide themselves but approach life with gusto and authenticity. This book is first in a series of books called Weddings by Bella, and I am looking forward to reading the rest in the series, if they are anywhere as good as this one, the mantra of “laughter is the best medicine” will surely be a cure for the winter blues. Keep us laughing, Janice! You have a gift for it and I’m glad you’ve shared it!